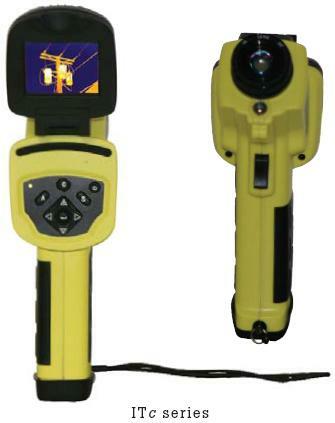 These fully radiometric thermal imager provide precise temperature measurement up to 1500°C. In addition, these cameras offer an excellent geometric resolution of 2.2 mrad and high sensitivity making therma ideal tool for spotting even the smallest temperature differences. The automatic hotshot detection, up to 4 moving measuring spots, the Acoustic alarm signal and an extreme close focus operating distance of only 0.1m, make the ITc series cameras a unique range of instruments. The camera offer a 2.5" movable tilt colour display which provide an excellent mean of protection when the unit is not in use. Light and ergonomic ITc series have been designed for one hand operation. The new Li-Ion field replaceable battery pack provides a 2.5 hrs continuous operation. These cost effective camera can store up to 1000 fully radiometric pictures. The camera is supplied as standard complete with the new IR Report software which provide and excellent tool for reporting procedure and images analysis. Additional telescope and wide angle lense are available. Each HotFind is supplied with 20°C optics, LCD display and laser, battery charger 110/230V, Li-Ion rechargeable battery, USB and video Cable, software package, calibration certificate and robust transport case.